The legislature is the distinctive mark of a country's sovereignty, the index of its status as a state and the source of much of the power exercised by the executive in the administration of government. In a working democracy, the legislature, directs the affairs and path of government. As one of the key institutions in a democratic system, the legislature has a critical role to play in promoting fair governance in the life of a nation. Thus, in achieving good governance, the existence of an active, efficient, strong and vibrant legislature is paramount. Democracy and good governance are not luxury, but a fundamental requirement to sustainable development. A strong and vibrant legislature is vital to a democratic system of government which is based on a system of limited constitutional authority distributed to different decision structures. This ensures that major political decisions are taken after thorough deliberations. The ultimate goal of creating multiple power centres is to ensure that they checkmate each other and thereby prevent the emergence of a dictator. The legislature, otherwise known as the parliament, plays a crucial role in gauging, collating and presenting the views and needs of the people, articulating their expectations and aspirations in determining the national development agenda. The importance of the legislature in ensuring good governance and accountability cannot be overemphasized as it is quite obvious that it is the backbone of democracy and good governance. But it is unfortunate that over the years, especially in this current administration, the Nigerian legislature(National Assembly), which occupies a prominent and pivotal position as the apex lawmaking organ of government under the 1999 Constitution, has failed to live up to the expectation and yearnings of the citizens. The only time we hear rumbling or squabbles between them and the executive, both at the federal and state legislative branches, is when the flow of cash between them is seized or when one moves against the vested interests of the other. This present 8th National Assembly in their manner of operation, have virtually turned themselves into a mere rubber-stamps as they sit idly and allow President Muhammadu Buhari-led federal government rule the country as his personal estates or companies with little or no resistance from the legislators. The National Assembly has also indicted itself of weakness and inability to oversight and hold the executive to account. They view budget defense as a yearly "parley" where various legislative committees and members of the executive negotiate sharing of the "national cake" with no interest to the masses. The power of oversight has been slaughtered on the alter of corruption and weakened by their crave to amass wealth at the expense of the masses. The Nigerian legislature have failed in their functions of supervising, being watchfulness and curtailing the excesses of this present executive actions and activities. Oversight function is a very important role of the modern legislature that preoccupies it. It ensures that the activities of the executive arm of government and its agencies, ministries, departments and parastatals are kept under constant surveillance and scrutiny by the legislature. The watchdog function is perhaps more important for a legislative assembly than that of lawmaking. The legislature provides the institutional mechanism for ensuring accountability and good governance. In most countries, the legislature is constitutionally mandated as the institution through which governments are held accountable to the electorate. It also includes scrutinizing every move both locally and internationally made by the executive, which brings to mind, the docility and lackadaisical approach by the National Assembly when President Buhari evaded them and hurriedly entered into a treaty with an Islamic Saudi-led coalition to counter terrorism without prior consultation with the Senate which has the power to ratify treaties negotiated by the executives and also investigate the legality of presidential decisions. And yet they maintained silence till date on this important issue. Again, is the mobilization and deployment of about 17,000 armed soldiers and other secret security agencies to Rivers state to oversee an ordinary state and national assembly re-run elections as if we were still in a military regime, and the national legislature kept quite on this. The high level of corruption, indiscipline and executive lawlessness with impunity currently characterizing virtually all government establishments and institutions in Nigeria have persisted because the legislature is weak and irresponsible to the plight of the people. The abduction and defilement of Christian teenage girls like Ese Oruru by the Northern Hausa/Fulanis has never formed a proper basis of discussion in the floor. Especially in the abduction case of Ese which was determined by Sharia law and Commission instead of the Nigerian Constitution which is supposed to be the supreme overriding law and its provisions as a binding force on all authorities and persons throughout the Federation. It is hoped and believed that if any other law inconsistent with the provisions of the Supreme Constitution, the Constitution shall prevail and the other law shall to the extent of its inconsistency be void. It is unfortunate that the National Assembly did not rise to this occasion. On the issue of pro-Biafra agitation in the country, the extra-judicial killings of pro-Biafra protesters/agitators by the Nigerian armed forces has not been deemed worthy of discussion and investigation by the National Assembly. I am totally disappointed by the Nigerian legislature, particularly the Senate in their inability to stall the move by the federal executive(President) to invite armed personnel to clampdown and use excessive force to quell the popular demand for a sovereign state, thereby turning the Eastern region into an occupied territory of sorts. Instead of the executive to stimulate negotiations for a peaceful resolution, they opted in deploying armed soldiers and mobile policemen to enforce "peace and order" in the region and yet the National Assembly kept quiet. No appeal to urgency or expediency however strong or passionate, can justify this joint breach of reasonable conduct by the Presidency. The leading role for the legislature has always been adjudged an essential defense against executive tyranny. They are saddled with the responsibility of to monitor, raise queries and where necessary, censor executive activities of government agencies(ministries, departments, and parastatals) to ensure good governance and accountability, and also to counterbalance the power between them and the executive and in some cases, between the state and civil society. Apparently, the legislature is one democratic institution that allows the various constituencies to which a state is delineated elect their representatives. In other words, it is an assembly of elected representatives from geographically defined constituencies. When elected, the representatives are expected to represent the views, concerns and interests of their constituents in the legislature. The presence of legislative institution in any modern polity suggests the indirect participation of the electorates in making decision on issues that affect their daily lives. Not only is the presence of a legislature salient to the acceptability of democratic regime, but also the extent to which the legislature demonstrates capabilities to freely demonstrate itself and assert its power determines how democratic the government would be. In fact, central to representative democracy is the notion that elected representatives of the people constitute the legislative arm of government. Indeed, effective representation of citizens in parliament is at the core of liberal democracy. This reason therefore stands to wonder why an overwhelming group of people from the Eastern region agitating for independence/self-determination has not called for an attention or subject of topical discussion by their representatives in the hallowed chambers of the National Assembly. The Nigerian experience has abundantly demonstrated that a part founded on the cornerstones of collective conspiracy of economic crime, otherwise known as; "You chop, I chop", cannot be responsive to the people's needs, but rather is self-fulfilling. The political inertia and slumber in the National Assembly has rendered evidence to this fact. It is common knowledge that a good number of members of the legislature in the National Assembly, pursue contracts from the leadership of the houses and even from the executive such that they easily compromise when it comes to contributing meaningfully to debates on the floor of the house. The legislators are particularly interested in constituency project funds, which American politicians call "pork". They are padded in appropriation bills by legislators as projects dear to their constituencies. Like I stated earlier, despite the powers, functions and privileges provided for the legislature in the Nigerian Constitution, they have not lived up to expectation. Apart from their lawmaking and policy formulation functions, they have derelicted their oversight and investigative functions. A national daily newspapers in 1963 once referred to the federal legislature as an "expensive and irrelevant talking shop". They had remained weak and vulnerable to executive manipulations under conditions of enormous concentration of power and resources in the executive presidency. The legislature as the hub of functional democracy, symbolizes the sovereignty of the people and embodies their destiny and aspirations. Legislation is not a robotic exercise. it is a product of deep reflection, an intellectual power to recognize the limitations of the society and how best to transcend them for the greatest majority of its constituents. Legislation is not a political apprentice nor a mercenary activity, nor should it ever be employed to advance the cause of political expediency. Legislators must strive to rise above mediocrity in their legislative functions. 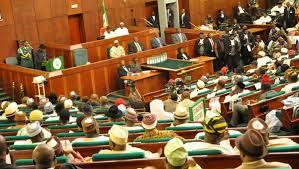 The National Assembly is expected to build the political will, which is needed to combat political corruption. They must foster personal integrity of legislators through codes of conduct to be in the right path. Since 1999, when the National Assembly assumed full power to legislate without undue interruption from the military, they have been a lot of loop holes from the side of the lawmakers that makes the citizenry begin to wonder if they are as honourable men and women as they claim to be. They should imbibe the spirit of good governance so that by their political education, convictions and inclinations, they are democracy. Since it is clear that we have a dictator in power, they have to establish a democratic system of government and the perpetuation of this system will depend upon their ability to convince people that democracy can be freed from these vices capable of destruction and that it can be efficient as any other system of government known to man. The legislators have to prove to the people that through a wise use of democratic processes, the welfare and safety of the people against executive tyranny and high handedness, can be promoted. The quality of the laws the legislators enact, determines to a large extent the type of government in power. Through their various actions, they can become catalysts for the real positive change in our much abused polity or impediments to the strengthening of democratic ethos. There is therefore an urgent need for the legislature to identify and contend with the various anti-democratic forces masquerading as agents of positive change in this current administration of President Buhari, some of which also abound in the present legislature and government. And woe betide any society that allows such forces, be they individual or organizational, to define for it the meaning and essence of democracy. For such definition given by them would be as genuine as the praises a colony of ticks may shower on the back of the bull on which they batten. And a society that "benefits" from such definition would become a replica of Hussein Ablates's atavistic society where the values and consciousness of foolish leaders define the values and consciousness of the entire society. Finally, I should call for a radical awakening from the present legislative slumber, draining meaning away from the present laughable experiment of democratization in Nigeria. The "change" I allude to is desirable for any society, a change borne out of historical contradictions and whose impact is usually irreversible. According to an axiom of social Darwinism, "change" is both evolutionary and revolutionary and involves a radical, structural differentiation of the elements of the political process. Ultimately, the performance of the Nigerian legislature, will be measured with the barometers of relevance and responsiveness. The relevance of the law they enact and to what extent such laws may be reasonably deemed to be reflective of their having been responsive to the need to promote the common good of the people above all other contending interests.